The core issue is simply good design: pedagogical, organizational and visual. In spite of the proliferation of online learning, creating online courses can still evoke a good deal of frustration, negativity, and wariness in those who need to create them. Professor Kristen Sosulski's second edition of Essentials of Online Course Design takes a fresh, thoughtfully designed, step-by-step approach to online course development. 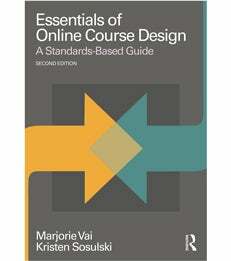 At its core is a set of standards that are based on best practices in the field of online learning and teaching. Pedagogical, organizational and visual design principles are presented and modeled throughout the book, and users will quickly learn from the guide’s hands-on approach. The course design process begins with the elements of a classroom syllabus which, after a series of guided steps, easily evolve into an online course outline. Kristen Sosulski is an Associate Professor of Information Systems and Director of Education for the W.R. Berkley Innovation Lab.